Description: How can disease modification in Parkinson’s disease become a reality in the near future? If Parkinson’s disease is not a single, homogeneous disorder, can advances in biomarkers and disease modification be revised to concentrate on commonalities of pathogenic mechanisms in large populations OR do they need to be reconstructed for application to smaller subgroups of patients, distinguished by well-defined molecular characteristics? The Steering Committee (Anthony E. Lang, Alfonso Fasano, Francesca Morgante, Alberto J. Espay, Andres M. Lozano, Lorraine Kalia, & Antonio Strafella) has put together an exciting program of world-renowned faculty of national and international speakers. 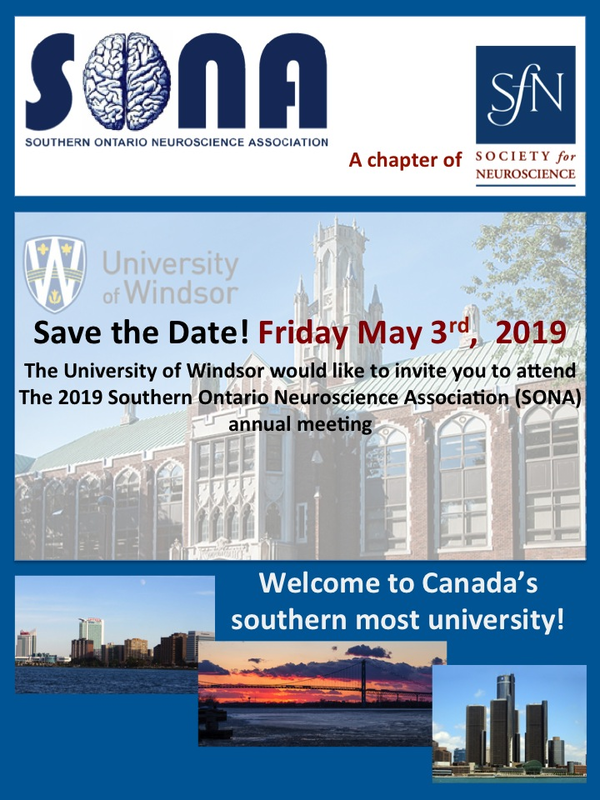 Description: The 39th annual Southern Ontario Neuroscience Association (SONA) meeting will be held at the University of Windsor on May 3, 2019. SONA (http://sonasfn.org)is a chapter of the Society for Neuroscience. The annual SONA meeting is a one-day regional meeting that provides an inexpensive opportunity for students,postdocs and faculty to present their work, to network, and to hear about all the wonderful neuroscience research happening in Southern Ontario. Information on the program and abstract submission will be available in January on the SONA website (http://sonasfn.org). Description: Neurotechnology is advancing at an astonishing pace which will bring massive benefits to people disadvantaged by disease, disability or injury. But where we rely on neurotechnology to enable communication, the stakes are high. Experts from industry, academia and legal professions will come together to discuss the social and ethical implications of neurotechnology relating to health, crime, and civil and disability rights. Find out what the future holds for neurotechnology.